Not all PVA (polyvinyl Alcohol) sponges are made the same. The biggest difference is that the ones we sell are made for the clean room industry, not janitorial supply. PVA sponges are made using two different pore forming processes. The process most commonly used to create the pore structure is made with the addition of starch. After the sponge material is formed, the starch needs to be extracted from the sponge by rinsing the starch out with water. Some starch is always left behind in the sponge and slowly precipitates out with use. The pore structure on our clean room grade sponge is formed by the injection of air or a gas, leaving no residue behind to precipitate out during use. PVA sponges are both static-free and lint-free. The finished sponge material has a three-dimensional, interconnected porous structure. This enables the sponge to be thoroughly cleaned and reused time and time again. The PVA sponge property to absorb and retain water and organic solvents is remarkable because of the hydrophilic OH-radicals in the molecular structure and the capillary action caused by its fine pore structure. It is resistant to organic solvents, acids and especially alkalines. 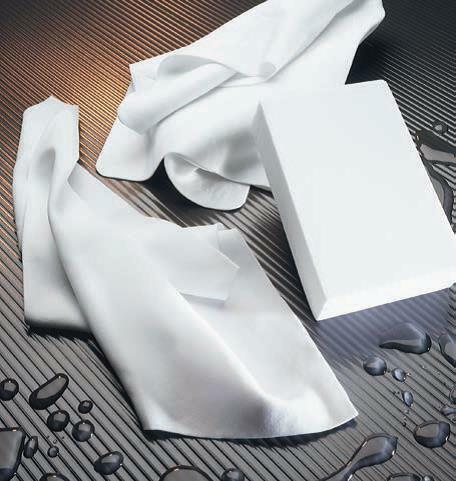 You will not find a more absorbent sponge; they can hold up to 12 times their dry weight of fluids. You will find endless uses for a PVA sponge, cleaning is but one; they are also excellent for humidifying. The density and pore size of our PVA sponge is unsurpassed. Our PVA sponges are pure WHITE in color containing no dyes or additives to bleed. Our standard PVA sponge measures 5" x 3-1/2" x 1-1/2" in thickness. Our large PVA sponge measures 7" x 3" x 1-1/2" in thickness. See more PVA cleaning products under Wiping Materials.